Saturday afternoons are perfect for so many things...sleeping in, running errands, spending time with your significant other...and making delicious homemade pizzas! Saturday afternoon pizzas are a favorite around here. We combine whatever we have in the fridge and make something super tasty. This time, I did make one thing (pesto! ), but it was worth it. When Jourdan shared a version of this pizza she said homemade pizza keeps getting better and better. She was sooo right! This was easily one of our favorites, and so simple to make. The flavors were awesome, and so not what you would expect from a typical pizza. I absolutely adore this homemade pesto recipe (link below), and I really think that's what took this over the edge. We're already planning to make this again in the coming week! Recipe loosely adapted from My Life as a Mrs.
*Preheat the oven to 425° F.
*Roll dough out onto pizza pan. 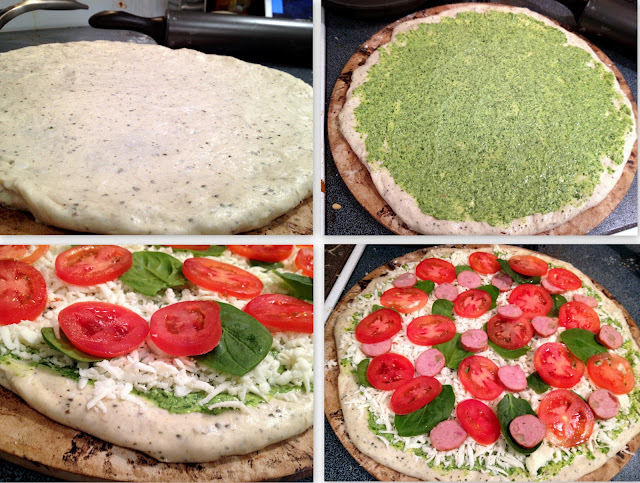 Spread pesto over entire crust in an even and thin layer. Sprinkle with mozzarella. Evenly spread the tomatoes, spinach and chicken sausage on top. *Bake for 15 minutes or until pizza dough is cooked through. Remove from oven and serve!